Now is the right time for Hussein Berry and others to reconsider what they have done, to recognize the damage their actions have caused and to join the healing efforts that this community badly needs. On Monday, a Wayne County Circuit Court judge dismissed a lawsuit against the Dearborn School District, the Dearborn Board of Education and its former president, Mary Lane, instituted by a disgruntled member of the board. Make no mistake about it, the lawsuit was a waste of taxpayers’ money that would have otherwise paid for critical services our students need. It also sowed more seeds of division in our growing community and divided it further and subsequently weakened and slowed its progression. Voters should long remember this monumental waste of time and money as well as the disgusting divisions it needlessly created. The court was right to dismiss this frivolous lawsuit in its entirety. In doing so, the court carefully considered the process which resulted in the appointment of businesswoman Celia Nasser to the board on June 19. The court concluded that the board properly conducted its vote for Nasser’s appointment and that all board members had their votes properly recorded and counted in accordance with Michigan law and the board’s rules and regulations. 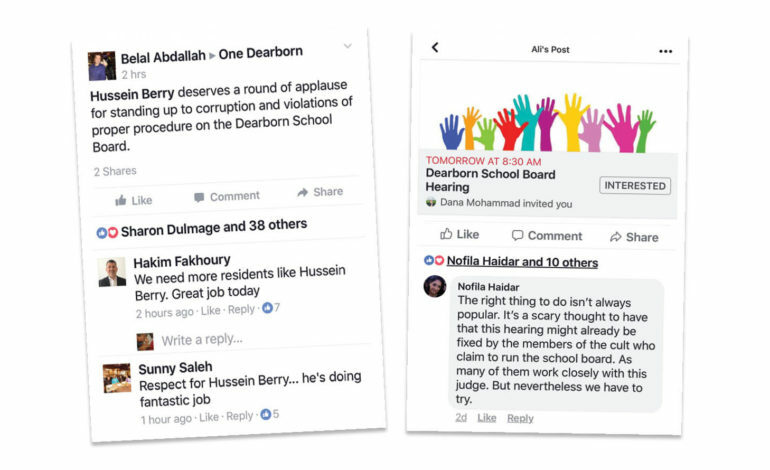 The accusations on Facebook by some in the Dearborn Arab community that the process was “corrupt” obviously had no basis in reality. None whatsoever. The lunatic fringe had every opportunity to make its case that the process was somehow flawed or rigged. Predictably, the court saw these ludicrous allegations for what they clearly were. Likewise, the unfair and vicious attack on AAPAC, its members and The Arab American News and its publisher were similarly baseless and nothing but lies, jealousy and hatred from people too lazy to do the hard work of building consensus, enacting sensible policy, making decisions, reporting the truth and protecting the interests of the students and the community we live in. Throughout the process to fill the vacancy created by Judge Mariam Bazzi’s departure from the board, the community never heard from Hussein Berry regarding his choice for that vacant seat. He was elected by Dearborn voters to make the hard decisions and build consensus with his colleagues for the best interest of the school district and the students, not to sue, bicker and divide. His initial proposal to move the decision from the board, where it belongs, to Wayne RESA raises justifiable doubts of his ability or willingness to make the hard decisions. Having a dissenting opinion is healthy, but refusing to yield to the majority is disruptive, divisive and counterproductive. Filing a lawsuit is a given right. Resorting to the rules of law is an honorable and responsible way to resolve a legitimate dispute, but in this case it was the ultimate irresponsibility. It was clear that Berry’s lawsuit was frivolous. His colleagues who had voted for another candidate accepted the decision and moved on. For that they should be commended. The ringleaders of the Facebook phonies have likely learned nothing from this judicial rebuke, but you, the hard-working and decent members of this community, should now consider the source when the agitators take to their keyboards and ask you to treat them with any amount of credibility. Absurd accusations were flying from Facebook, with people making up events, creating stories and smearing reputable individuals and organizations, just because the outcome may not have suited their desire or expectations. Even the judge on the case didn’t escape the assault; he was accused of clandestine dealings and corruption before the case was even heard. Now the community knows the truth from the court itself. There was no corruption, no backroom dealings. The process was clean, lawful, open and transparent. Now is the right time to assess the outcome of the actions and the damage that was created, to recognize and admit to the mistakes that were made and start the healing process as the community faces many challenges and critical decisions that require unity and cooperation among us all.